I read this book for my AP Literature class. I loved the teacher, loved the subject matter, and loved pretty much everything else we had read, so I had high hopes for this book. I must say, I made a genuine and sincere effort to like this book, I really did. I got half way through with no hope in sight, yet I perservered, hoping the second half would show promise in the next generation. No such luck. Although nothing tops the finale "love scene" between Heathcliff and Katherine, with Heathcliff foaming at the mouth and a verbal battle of "no, YOU killed me" "no, you killed yourself" (a stupidity hiterto unknown since the "no YOU'RE prettier" battles). Eventually, the final pages came into view and I was desperate- there must be some redemption for this junk! Some message, some ending sequence, SOMETHING that makes this worthwhile. The characters are so self-absorbed and posses an unprecendeted lack of intelligence, yet are still portrayed as intelligent by the literary world, that it seemed like the only fitting ending would be the characters realizing their stupidity and engaging in a mass suicide. No such luck. Every last word was idiotic and as empty as the first. But you know what grinds my gears even more than the fact that I wasted a week on this worthless pseudo-classic? It kills me that people not only mistake this hoax for real literature, but reference it for ROMANTIC value! Foaming at the mouth, marrying someone you don't love, wow.... now that's a level of romance lovers fantasize about achieving. Sign into Goodreads to see if any of your friends have read Wuthering Heights. brilliant review on a not brilliant book. thank you--you verbalized perfectly EVERYTHING I hated about this book. Having read this twice, about 8 years apart - hating it the first time, and loving it the second - I just wanted to respond a little to your comments. The one that stuck out was the one about "marrying someone you don't love." Catherine marries Edgar for two reasons - I think she DOES love him, although it is not the kind of all-consuming, unchanging love she has for Heathcliff; but secondly, she explains to Nelly that she marries him so that she can help raise Heathcliff in the world. She says that she knows that if she and Heathcliff marry, they will be beggars, but if she marries Linton then she can use her position to benefit Heathcliff. I wonder if Heathcliff would understand this. On one hand, I'd think that he would say that he and Catherine should have been together no matter what, but on the other hand, he would probably understand the idea of Catherine making sacrifices for his benefit, the same way that he never harms Edgar Linton just because he knows it would hurt Cathy. Anyway... I do think that Heathcliff and Catherine love each other, although they both have really serious character flaws which end up making their lives, and the lives of everyone around them, miserable. I haven't read this one yet but I am thinking about it. Now that I read your review I would really like to know what other books you read in that class you mentioned, maybe there's one there that I should read instead. Right now I am actually looking for so-called classics I haven't read yet. yes, I'd like to know what other books you read too. not that my to read list isn't already long enough :) but it's always good to have ideas to read later. Hmm. First of all, for someone in "AP" you don't seem to know how to use paragraphs very well. Anyway, how is it that you - a high school student - have ascended to such literary greatness that you can dismiss this brilliant work as a "pseudo-classic" and "junk"? You can do better, I presume? I eagerly await publication of your "bona fide" classic. You may not ever LIKE this book (I wouldn't have if I'd read it in high school), but I believe, with age and perspective, you'll learn just how little you know. I doubt the review you're bashing was targeted at literary snobs. we're all allowed to have opinions on things without being college professors in the subject, and not all of us think maturity=loving books about selfish, hateful people, no matter how well people say it's written. I found your comment much less helpful than her review. Nice try with the straw man argument. This isn't about loving or hating anything, or being allowed to state an opinion. It's about spurning something as a "hoax" simply because you don't like it. See the difference? what I was trying to say nicely was that your comment was very unhelpful. you didn't give us any additional insight into a miserable book, or why we should consider giving it a second chance or look at it from a different perspective. you just implied we're stupid for not loving a book that you, the "intellectual", apparently do. this is my last comment on this topic. if you want to feel superior, justified or not, go try it elsewhere. You have a strange way of saying things "nicely": name calling, making assumptions about me, putting words in my mouth, ordering me to "go try it elsewhere"...see why your comments don't merit "additional insight"? When I read the book, I appreciated how depressing it all seemed. None of the people seemed like they had any intrinsic need to be altruistic, and I thought that seemed real. I think if I went back and read it, though I am certain I'd connect with a few of the situations, I'd be sick of the book pretty sick. I don't mind a depressing book or too; take my take on Sybil, for instance. But there comes a point where I need to see a light through the end of the canyon, to know that there ARE people who are actually good people. What I got from this book, was that there really isn't anyone who is a good person out there. And, just because that may cause people to think, doesn't make this a literary genius. Catherine couldn't have married Heathcliff because, in those days, it was illegal for people brought up together as children to marry. I pretty much love you. I almost wrote about how much I hated this book on accounts that it goes NOWHERE. IT GOES BACKWARDS IF ANYTHING! I really cannot emphasize that fact anymore than you already did. Thank you so much for your opinions on the book. I wonder why it is a "classic" myself. Hi! I loved the book, but I must say I really liked your review of it too. It's interesting to see why people dislike a book that you like. I just have one little comment to make about your perception of the "romantic" side of the story. Romanticism,as it was understood in the 19th century, had not much to do with happy-ending love stories (this is actually our nowaday-definition of the word) but it had more to do with the attitude and the feelings of the character, the subject of melancholy, loneliness, introspection, etc. And when you consider the novel from this specific definition, which was the definition of romanticism at the time, then it fits it perfectly. I personally don't care about whether a love-story ends well or not, but I love the way such a young female author of the time could imagine such tormented and gloomy spirits: that's highly romantic! and indeed, mass suicide would have been too. "It kills me that people not only mistake this hoax for real literature"
If this novel is seen as real literature to many people, what makes it from being real? What makes you right in thinking this novel is a "hoax" while others think this novel is brilliant? There is a hidden passion that is hiding inside the pages. The passion that arises when Heathcliff and Catherine are together. From childhood, they can't be separated. They understand each other and love only each other. The world is nothing and was nothing until they found each other. "so he shall never know how I love him: and that, not because he's handsome, Nelly, but because he's more myself than I am. Whatever our souls are made of, his and mine are the same" This quote explains the feelings she can't express to the man she loves (wasn't it illegal to marry the person you were brought up with), so instead, she rots from inside. She rots because because she is not a full person. Heathcliff rots because he is not a full person. They are both split and cannot seem find a way to attach back together, like how they were attached when they were children. Now, I know she and Heathcliff were horrible and not likable, but that is the point. I felt like this was a message to the readers. Here are two people who are supposed to go through life together, as lovers, but the cruelty of the world separated them and now they will have to live even though they are dead inside. How can you be alive when a vital organ is missing? It's like going through life with half a heart. You cannot function like a normal person. It's impossible. That is why they were horrible, they were broken. You know that feeling that something is missing in your heart? Something or someone is not by your side and you start feeling like you are not whole. ...and you start getting agitated and Impatient....like waiting for someone that won't come....ever! Some might roll their eyes at this and say melodrama! But I find this novel to be true to every person's broken heart. Not being able to touch and feel the person you most love in this world can destroy you. From inside out. I think Emliy Bronte wrote a novel that desribes the hidden depth of the human emotion. I respect her. I respect this novel. I think she was a brilliant writer and observer. Rebecca-That's not why they couldn't marry. Cathy simply stated it would "demean" her to marry Heathcliff. He expected he WOULD marry her and found out he wouldn'y while eavesdropping. Heathcliff wasn't adopted. Kellie, I think you're missing the bigger picture here. What I've come to realize is that when critiquing fiction; there is a fine line between liking and understanding. I've read this book several times a year for over a decade now, because something in it captures me: which is personal preference, obviously, but considering I love all the books that you recommended I really feel like you might be cutting yourself short. The story is much more complex than the basic factors of two self involved individuals that enjoy making people's lives hell... If you ever pick it up again pay attention to other details. The time period it was written in; the imagery; the most passionate vendetta and plot. I'm not sure if you're familiar with Brontes poetry, but the woman was against her time and absolutely brilliant. Sometimes even in the darkest ways. There is a credit that this piece deserves... I certainly hope that if you are a lover of the written word, you give it the chance to understand why that is. Amy wrote: "Kellie, I think you're missing the bigger picture here. What I've come to realize is that when critiquing fiction; there is a fine line between liking and understanding. I've read this book sever..."
I genuinely wanted to like this book. Instead, I was 'treated' to page after page of badly behaved, self-indulgent, brooding characters of weak moral fiber. ugh. Who says that for a book to be "good" characters must be "good". This story had nothing to do with morality or fairy tales; it was meant to be dark, brooding and passionate. When people let go of their expectations of what characterizes a "good" book, they can then appreciate and respect it for what it is. Who says that for a book to be "good" characters must be "good". This story had nothing to do with morality or fairy tales; it was meant to be dark, brooding and passionate. ..."
*Here Here* Besides...if everyone behaved the way we wanted them to, there wouldn't be any fictional characters at all! Exactly the reason why Wuthering Heights is such a great. The passion is so deep and unlike any other novel. Emily Bronte obviously poured her heart into her creation. Kellie. I believe it is entirely possible to write a review of a book which you dislike; indeed in my own case I dislike "Wuthering Heights" heartily; without casting it, and it's fans [for "Wuthering Heights" possibly numbering in the hundreds of millions worldwide] into thicko-land for being too stupid not to realise they've been hoaxed. They not only pigheadly insist on seeing it as great literature, which it obviously can't be since you have told us it isn't, "but reference it for ROMANTIC value!". It really is astounding that so many inadequates manage to walk and breathe at the same time. Personally, I cannot find anything about the characters that makes me care about what happens to them. "Wuthering Heights", in my view, is over-emotional and over dramatic. I cannot believe that an emotional powerhouse, like Catherine Earnshaw, would ever agree to marry a man like Edgar Linton, the archetypal 'fine, upstanding member of his community'. However, I have to admit it is very well written. 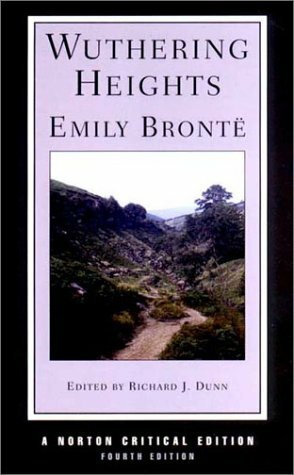 "Wuthering Heights" does achieve what Emily Bronte set out to achieve. As Gattaca points out, Emily put her whole heart into creating the novel, and the titanic passions which doom Catherine, and through her both Heathcliffe and Linton. Moreover, it is us who call it a romance, meaning a piece of fiction about a love story. Emily Bronte would not have understood this modern sense of the word as applied to her work, although it certainly is one. It is, though, something much more than that. Emily would have used the term 'romance' to mean an extended tale of heroes (and in the case of her novel, anti-heroes and anti-heroines) and of extraordinary or mysterious events. A description which even I, by no means Emily Bronte's biggest fan, find remarkably true to both the story and characters of the book. None of that means I like the book, as I said I dislike with a passion. But 'great literature' is great because one hell of a lot of people believe it to be so, and somewhere in all of them we can find most literary academics; who also have a hell of a lot more experience in critiquing literature than I do. Believe it or not, there are things which will are formally taken into account by these people, such as: how well the author develops the plot central to the story; the portrayal of characters, and the believability of how their inter-relationships work; the realisation of time and place; and how an author's use of language fits with the whole ethos of the story (amongst other things). To have a "books-that-should-cease-to-exist" shelf, where "Wuthering Heights" should be put, is actually quite a dogmatic idea. I can think of no book that deserves being put on that shelf. Even Barbara Cartland, who wrote, in my opinion, the biggest load of utter tosh imaginable would not go on it. Many millions of people derive enjoyment from reading her books, it is not for me to say "that's complete cobblers, you mustn't read that but have some Dickens and be grateful I don't make you read 'Paradise Lost'". I, too, could be arrogant enough to want a shelf labelled "reviewers-who-should-cease-to-exist" but then I've no doubt that your family and friends wouldn't be too happy about that. Dislike what you will, literature is a highly personal thing. But people are not thick because they like what you don't, and they have not been conned into believing "Wuthering Heights" is 'great literature' , any more than I will be conned into believing you are a great reviewer. thank you... someone who feels my pain at the total hopelessness and selfishness of the characters and the story! Thank you for this review. I couldn't agree more. Anja wrote: "It's a classic, you just didn't like it. That doesn't mean it's not good." honestly it is hilarious how worked up some get over another person having an opinion. David wrote: "Kellie. I believe it is entirely possible to write a review of a book which you dislike; indeed in my own case I dislike "Wuthering Heights" heartily; without casting it, and it's fans [for "Wuther..."
I merely said that I wanted to like the book but I didn't. Pure and simple. That should not be an offense to anyone as I did not say anything negative about those who do, nor did I discredit the author or insult any particular person. The lovely thing about opinions is that I am free to have one, and you are free to disagree with it. K I after reading all of the controversy on this book I absolutely HAVE to read it! "Foaming at the mouth", now this is unacceptable. Totally agree, a torture to read. Hate every single character in this book. The fact that here are so many people like this book scares me. "Although nothing tops the finale "love scene" between Heathcliff and Katherine, with Heathcliff foaming at the mouth and a verbal battle of "no, YOU killed me" "no, you killed yourself" (a stupidity hiterto unknown since the "no YOU'RE prettier" battles)"
Genuine LOL here reading that. I was like "Jesus these people DESERVE each other" by that point.